I love plugins, don't get me wrong — but sometimes I want to know exactly what code is being added to my site and why. The “new” Universal Analytics are totally doable to hand-code in, no plugins needed. Let’s start with finding the basic starter code for your Google Analytics property. Copy this code and open the file in your theme that contains the closing </head> tag. (For many WordPress themes this is header.php.) Paste this directly before the </head> tag and you are good to go! Give Google time to collect the data, and soon you’ll see beautiful statistics from your site, right in Google Analytics. I’m guessing you aren’t happy yet, though. So let’s look at how the Universal Analytics custom dimensions can make your analytics even more useful. “Custom dimension” might sound pretty loopy, but it’s simply one other piece of data for Google to track. Google is already tracking lots of data each time a visitor spends time on your site: the name of the page they went to, how long they spent there, what operating system they were using at the time… these are collected all the time for every single Google Analytics property, and they’re all useful for different things! But we can give Google even more information to track. 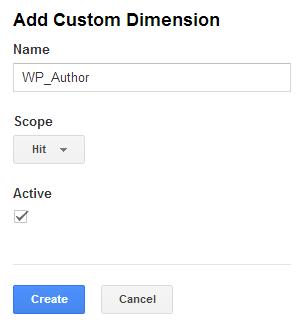 For an example, I’ll go through how to add a post’s author as a custom dimension. From your Property settings under Custom Definitions, click “Custom Dimensions.” Here we can create a new custom dimension for Author. Now Google is ready to start receiving data for this dimension, so we’ve got to go back to our tracking code and tell Google what to collect. Since the author varies depending on the post, we’ll first need to create a php variable to hold that information. In this example, our php variable is $gaAuthor. Awesome! Now we’ll be able to see our author data within Google Analytics. After waiting a little while for Google to collect some data, we’ll be able to see our new custom dimension. At first glance you might not be able to find your custom dimension. Never fear, it’s in there waiting for you to use it! In this case, I had named my custom dimension “SP_Author” back in Step 2. Questions? Better methods? Let me know in the comments. First, I’d like to say thanks for making this post and I finally found the solution from your blog. I was using Joost’s wp analytics plugin and it isn’t working. After your workaround, things are looking good. I was also able to track the category too using the categories functions! Your such a big help and I sincerely thank you for posting this. So far, WP forums weren’t giving simple solutions for newbs like me. Take care and keep rocking!!! Awesome! I’m so glad this helped you. I too started with the Yoast plugin and then realized it just wasn’t cutting it. I would be really interesting to know how with this method you are tracking the categories of your posts? Hi, thanks for this walkthrough! I know it’s a bit of an older post, so apologies for only just commenting. I’m trying to get this working on my site, but when I follow all the instructions and check the source code, the author variable data isn’t pulling in. I’ve tried clearing all my caches and trying again, and nothing. I tried putting the php in header.php, and when that didn’t work I tried putting it in its own separate plugin file and activating it, and that didn’t work either. Any idea what might be going on? Can you suggest me for category and publish date as you done for author. Ir would be very helpful for me . Hello, many many thanks for this useful code! Let me also join the fellows above kindly requesting that you also incorporate category tracking in this code. Would be highly appreciated. Your code is exactly what i was looking for, but i need to get some info from woocommerce such as product id, price and final URL. Can you help me find those three variables? Dear Christina, this post is very useful. However, I expected to see some plugin that could do the work on WordPress blogs. That would have been awesome for non-programmers out there. Also, I believe the datalayer push could be done using a GTM implementation. For people who need more custom dimensions than the author I added this to Github. Left header image: A local 2D cross-section of the real 6D manifold known in string theory as the Calabi-Yau quintic. Credit Andrew J. Hanson, Indiana University. Right: A screenshot from a Google Analytics property.